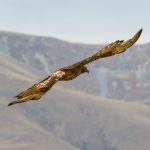 A Hunter’s Paradise: New Zealand Birds of Prey | Topflite Ltd.
New Zealand’s long period of geographic isolation has given us some weird and wonderful species of birds. While some of our more unique inhabitants like the kiwi and kea are world-famous there are also some pretty impressive high fliers cruising our skies. Thankfully for all us bush-walking, nature-loving Kiwis, New Zealand’s wildlife is a fairly tame offering. Unlike our neighbours across the Tasman and their abundance of ferocious marsupials and deadly reptiles, we can go about our daily lives relatively unscathed. But it wasn’t always this way. Around 600 years ago, the Haast’s Eagle took to the skies above the South Island. With its tiger-like claws and ferocious beak, this impressive creature is believed to have been the biggest eagle to have ever lived on the earth. For food, it hunted moa (a mere 200-kilogram morsel). So when moa were hunted to extinction the Haast’s Eagle went the same way. We lost a bird of prey that was far more terrifying than anything the Aussies have ever been able to deliver. A bird of prey is any bird that hunts for its food. Birds of prey are characterised by the clawed talons and hooked bills that help them catch and devour their prey. Nowadays our birds of prey exist on a much more modest scale. 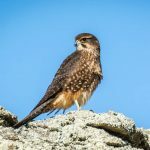 Look to the skies by day or night, and you may spot one of New Zealand’s three native birds of prey searching for a meal – the Kārearea (NZ Falcon), the Kāhu (Swamp Harrier) and the Ruru (Morepork). They’re not quite the size of a Haast’s Eagle, but still very impressive hunters. Reaching speeds of up to 300 kilometres per hour, this impressive hunter chases live prey, often seizing it mid-air. The Kārearea is commonly found hunting in forests, but can also be found in open landscapes. They have been known to become aggressive towards humans or large animals when they nest on the ground and it’s not uncommon for them to perform some extremely aggressive dive-bombing to protect their young. The Kārearea preys on medium-sized birds, but will also take on shags, poultry and rabbits. The impressive Kāhu is often seen cruising in the thermal currents searching for prey. It is an effective hunter in open habitats and has a wide diet that includes carrion, as well as live prey including birds, small mammals and insects. The Kāhu is often mistaken for the Kārearea. A good way to identify it is by the distinctive v-shape that it sets its wings to when gliding. 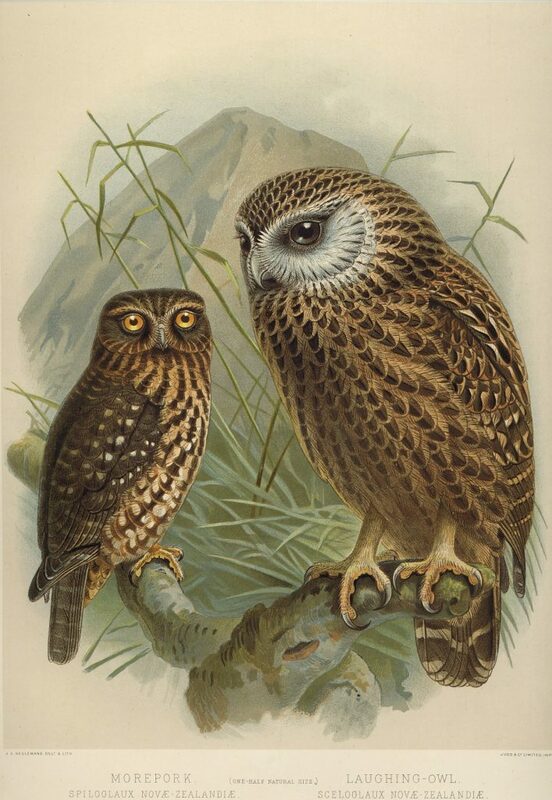 The Ruru is often found hunting at night, feasting on beetles, weta, moths and spiders, and they’re also known to take birds, rats and mice. The melancholic cry of this nocturnal bird is often heard at dusk and throughout the night. 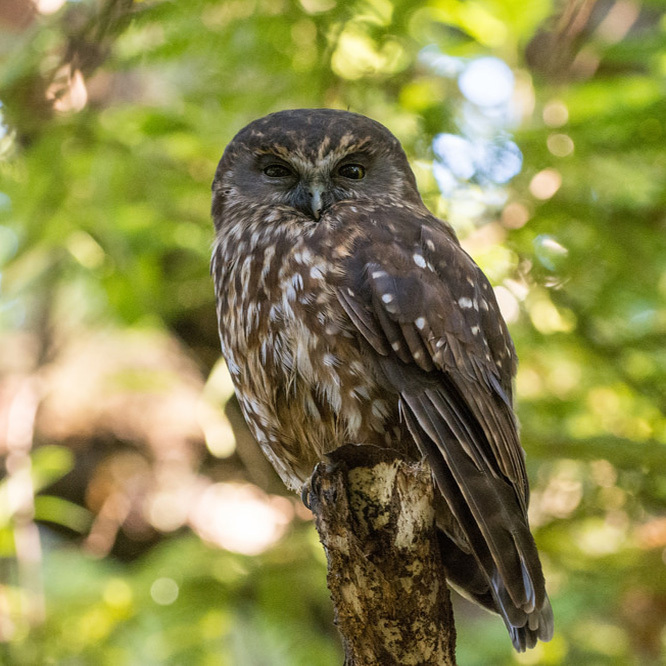 Ruru are incredibly effective hunters because of their ability to fly silently above their prey before striking. It’s said that when Captain Cook visited New Zealand in the 1770s he was met with deafening birdsong, such was the abundance of New Zealand’s fauna. Amongst the cacophony there were no large land mammals to hunt the birds. This abundance of food would have once been a paradise for birds of prey. When the European settlers arrived, they considered New Zealand a pretty dull place. And so they introduced game animals for ‘a bit of fun’. The effect of this decision has been prolonged and calamitous for both native flora and fauna here. These days, foreigners in the ecosystem include red deer, chamois, thar, rabbits and possums, stoats, rats, cats and weasels. All can impact on the native bird population. Today, our natural environment faces many challenges, and its bird population is precarious. There’s no question that our native birds of prey fulfil an important role in the delicate ecosystem. That’s why it’s so vital their habitats and food sources are protected before they too go the way of the Haast’s Eagle.